Popular vote inflicted a defeat on Chávez’s party. But the vote of the Justices of the Constitutional Chamber of the Supreme Court gave them a victory, bypassing the will of the people. Following a request filed by a group of councilmen and councilwomen of the United Socialist Party of Venezuela (PSUV) on February 27, 2015, the Supreme Court decided to uphold the dismissal of the mayor of the José Antonio Páez municipality (Guasdualito) in Apure state, Lumay Barreto. The ruling, issued on June 1 of that year, enabled the ruling party to regain a space that had been denied to them by the citizens in the municipal elections of December 8, 2013. The highest court of the country removed opposition mayor Barreto and ruled in favour of the chavista councilmen, who reported “serious irregularities” and a “vacuum of authority” that reportedly had “interrupted the normal functioning of Public Administration.” Thus, the case presented by Justice Gladys Gutiérrez validated the claim that the mayor of Guasdualito had been absent from her office without fulfilling the legal formalities. Barreto is part of the Voluntad Popular (VP) political party, whose founding leader, Leopoldo López, is being held in the Ramo Verde military prison since February 18, 2014 accused of plotting against the government of President Nicolás Maduro. Before Barreto, the judiciary had removed and imprisoned the mayor of San Cristóbal (Táchira) and VP leader, Daniel Ceballos, for the protests that took place in 2014. Similarly, two other members of the VP leadership, Antonio Rivero and Carlos Vecchio, went into exile to elude arrest warrants against them. 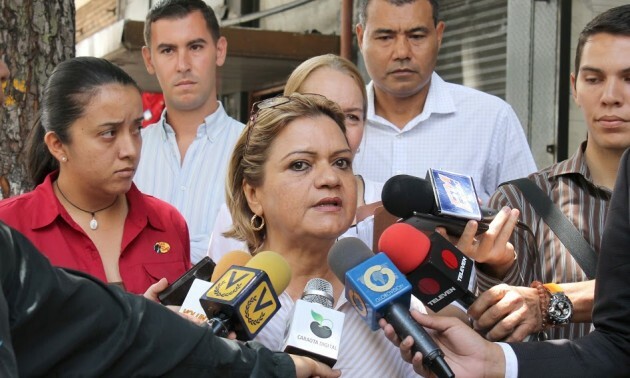 After hearing the sentence, Barreto said that since she became mayor of Guasdualito she had to face the attacks of the governor of Apure, Ramón Carrizales (PSUV), and from the central government. “The government did not allow me at any time to exercise my position as mayor as I should have. They took away the machinery of the municipality and dismantled the institution,” she told the media. On October 8, 2013, 11,006 residents of Guasdualito challenged the power of the PSUV to elect an opposition woman as mayor of an emblematic town in the Venezuelan plains. Less than two years later, seven judges silenced the voice of the people and gave chavistas their stronghold back in that region. Serious irregularities were allegedly committed by (…) [the] mayor (…) which, according to the petitioners, incurred in abandonment of office, a situation that resulted in a “vacuum of authority” which has interrupted the normal functioning of Public Administration, which adversely affects the effectiveness and efficiency of the delivery of public services (…) considering that an absence of the Mayor allegedly occurred, without due process, which in turn would have led to the neglect of municipal powers in health and others, in order to comply with the relevant administrative continuity and especially for the resumption and effective delivery of the respective public services (…)”. Official Councilmen and Councilwomen of the Municipal Council of Páez Municipality in the state of Apure (María Sonys Cote Rivas, Jerson Alid Mancilla Ojeda, José María Romero González and Uvance Norberto Martínez Romero) vs. Mayor of the José Antonio Páez Municipality. constitutional protection admitted, establishing the absence of the Mayor and agreed that Víctor Argenis Blanco Sáez should take office as acting mayor, while the case is decided upon for the protection of collective interest.